The team behind Microsoft Live Labs has announced that it's collaborating with the BBC to launch three dimensional photographic representations of historic sites throughout the UK. The online 3D viewing experience will be available in conjunction with the BBC's new series ' How We Built Britain ', which will run from now until mid-July. The time-limited technical trial uses Microsoft's Photosynth 3D imaging technology. 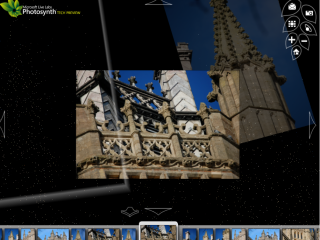 It allows viewers to explore 3D representations of Ely Cathedral, Burghley House, the Scottish Parliament buildings, Blackpool Tower Ballroom and London Bridge. On selected dates throughout the television series, the BBC will have units on location at each of these historic sites to collect images from tourists who wish to participate. The photosynths will then be updated during the series with a selection of the images submitted by visitors to the locations. Historical and viewer-submitted images will be integrated into the photosynths to contrast how people interacted with the locations in the past with the present. Viewers and tourists from around the globe will be able to explore the Photosynth representations via the website . By clicking and dragging your mouse you'll be able to explore each building. You can zoom in to see the smallest decorative detail, or zoom out and pan 360 degrees to place the building in a wider context. "Photosynth is an extremely immersive experience where one can find oneself spending hours walking in the footsteps of the photographer and exploring minute details of the 3D environment," said Adam Sheppard at Microsoft Live Labs. "This opportunity with the BBC allowed us to test the limits of the Photosynth technology by integrating photographs from decades ago of the United Kingdom's historic sites along with those of the general public today. We're eager to see how people tell their stories with this new interactive medium." To submit a photograph to 'How We Built Britain', visit the submission site .